We are the renowned manufacturers of a wide range of safety items that includes safety helmet, glasses, gloves and knee cap. Our range is designed and developed keeping in mind the safety and comfort level of the user. These are fabricated using qualitative raw material and ensure optimum quality finish. - FRP Industrial helmet with chin strap and nape strap. - Available in matt or glossy finished. - Available in white, red and yellow colour. - Available with BIS : 2925 and DGMS approved and marked. 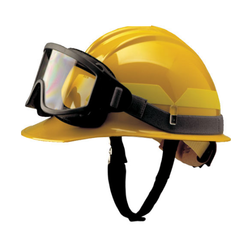 The industrial Safety helmet is a excellent hard hat, used by operators in every industry. The shell is made with a durable injection-molded, high-density polyethylene and provides superior head protection. We offer extensive and comprehensive range of Industrial FRP Helmet. Application: Industrial, Agricultural & Construction Machinery. • Designed specially to use with Helmets. We are leading supplier, dealer & retailer of safety helmets for labors that are essential for head protection during construction jobs and mining process.